On the eve of the New Year I have Great news! Our 3-month prepaid Paper Pumpkin subscriptions are on sale for Sale-A-Bration (January 5-March 31, 2016)! 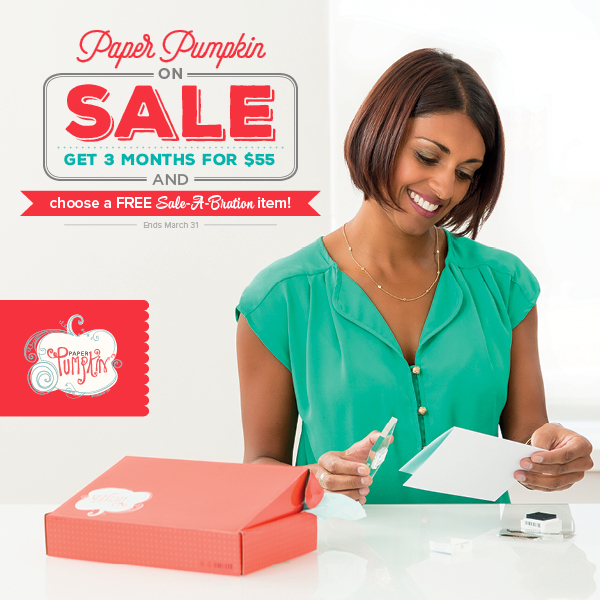 It’s a great time to try Paper Pumpkin and the easiest way to earn FREE Sale-A-Bration items. Get Ready … Sale-a-bration Starts JANUARY 5th! 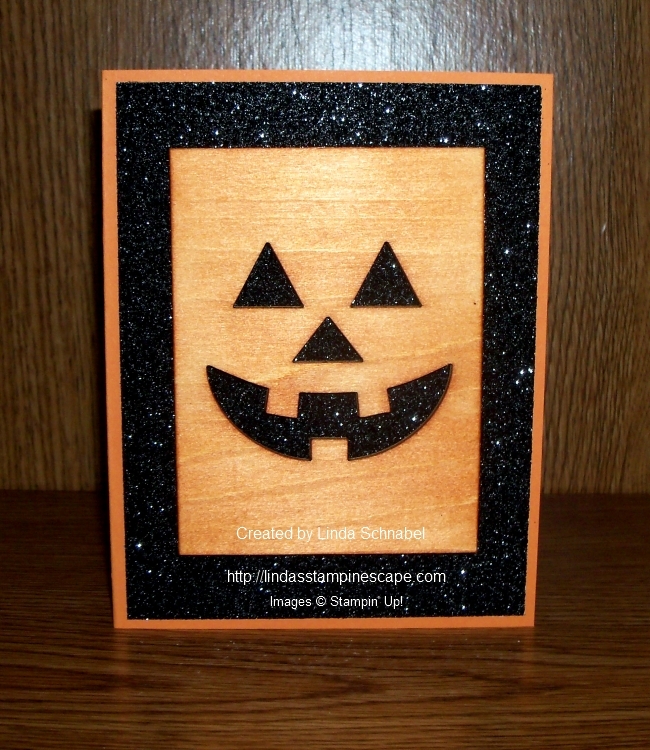 CLICK HERE TO VIEW “PAPER PUMPKIN” SAMPLES! Enjoy your New Year’s Eve and I’ll see you tomorrow with another Sneak Peek for the Occasions / Sale-a-bration Catalogs! Today I want to share two items that are found on the “Year End Sale” and that I use a lot for quick and easy cards. Yes, they were created for easy scrapbooking but I love the fact that I can use an item for many different purposes. Make the most of the holiday season, then bundle up your memories in an album that lasts and last. Memory keeping is super simple and super beautiful with Project Life card collections. Just slip these designed cards into Photo Pocket Pages for instant color, design, and journaling space. 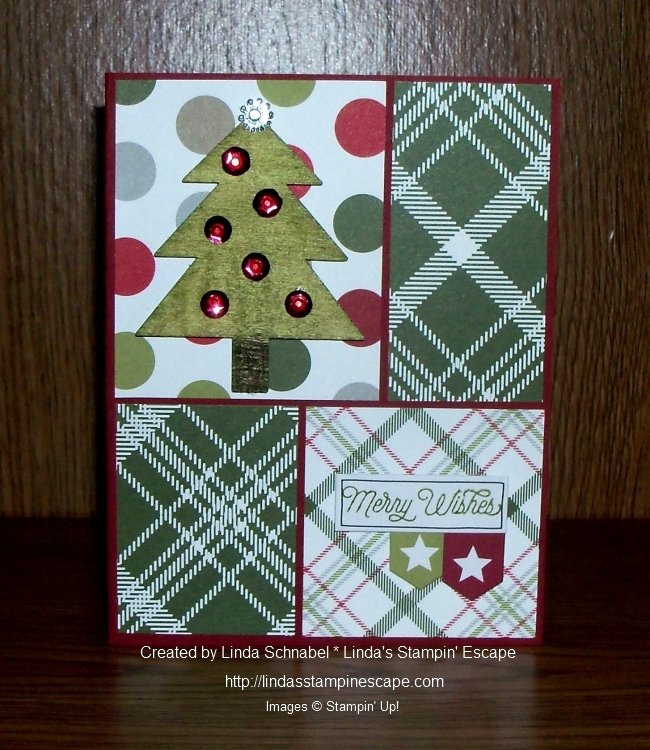 You can also get the coordinating embellishment kit …. Dress up your Project Life pages with the accessories in this pack. They’re also great for more than just Project Life; use on cards or traditional scrapbook pages too. What do you think of these cool products? 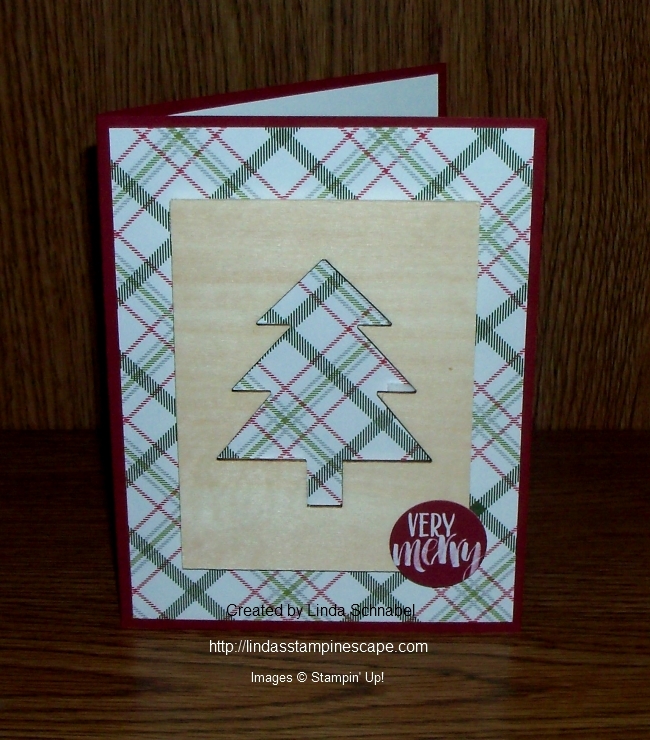 Are you strictly into cardmaking or scrapbooking or do you dabble in both of these fun activities? I’d really like to know were your passions lie. Thank you for stopping in on me today. WOW … What a snow storm!! I’m very grateful that my get-a-way is planned for NEXT week Monday, and not yesterday!! Last year when we went it was – 4° … yes, minus four degree’s!! I also have the list from the YEAR END SALE for you to view too …. Thank your for checking out my blog today. Let me know if you need any help, or have any questions. I am here to help. It’s been a great year … ups and downs as any year but I feel so blessed to have my friends, family and fellow stampin’ enthusiasts in my life. You make my life so much richer. Today I’d like to share with you our exciting December Paper Pumpkin. Since it’s a 2016 calendar, make sure you don’t let your red box sit around. Take some time before the new year to assemble it—you’ll be so glad you did! This cute calendar would be the perfect addition to any desk, shelf, or countertop. For those of you who have purchased your Paper Pumpkin kits from me “My Pumpkin’ Pals” watch for an invitation to come and stamp your calendar with me!! And, as always, with a little creativity you can make the kit into just about anything you can dream up! We even turned it into an adorable mini scrapbook. Separate your photos by month, punch some holes, and you’ve got an instant scrapbook for 2016. 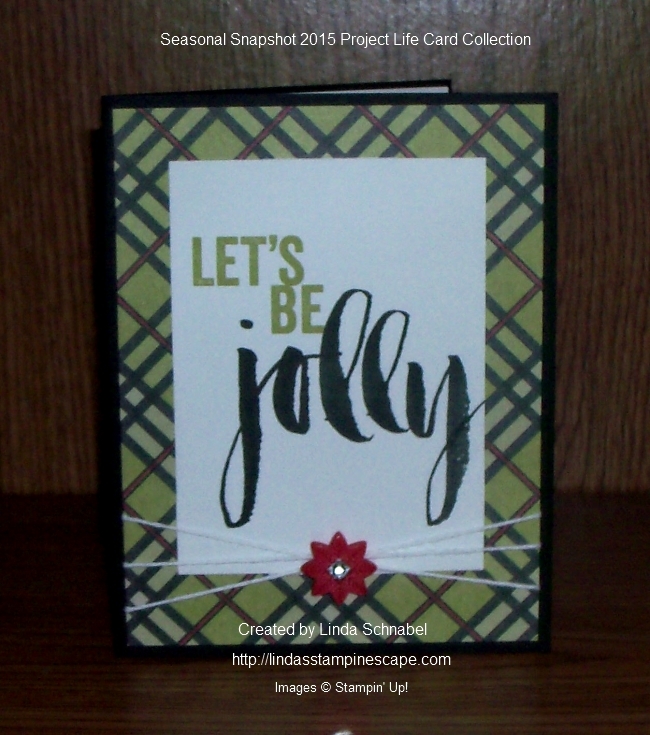 Or, you could easily turn those gorgeous background papers into card fronts. There are so many beautiful colors and patterns to choose from. Anyone would love to get this card from you! Check out this adorable birthday card with the stamp set. Highlight a specific date to make someone feel super special. We’re so glad you love this kit too—we sold out of refill kits in record-breaking time! Still not a subscriber? CLICK HERE to to sign up by January 10 so you don’t miss any kits in 2016! Let me know if you have any questions … I’m here to help. 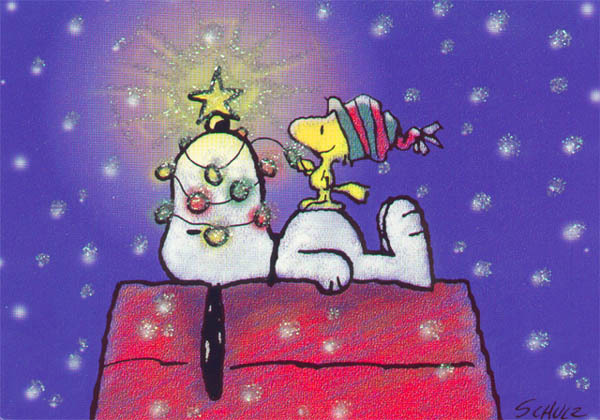 Hope you are getting to relax a bit this weekend after your Christmas holiday, but still have the opportunity to enjoy your friends and family… after all, that is what this beautiful season is all about. Today I have another Sneak Peek for you! A Sale-a-bration stamp set and the new “Botanical Gardens” Designer paper from the upcoming Occasions catalog. For those of you who don’t know, Sale-a-bration is our most anticipated event of the year …. This simple layout is my “go-to” layout when I need to create a quick card and it can be used from birthdays to sympathy cards and everything in between. Plus … you’ll be part of my “Star’s by Design” group. I host team meetings and retreats where we share ideas, laugh, and make new friends. As always, let me know if you have a question with our Sale-a-bration event, the new Occasions catalog, or joining my team. I’m here to help. 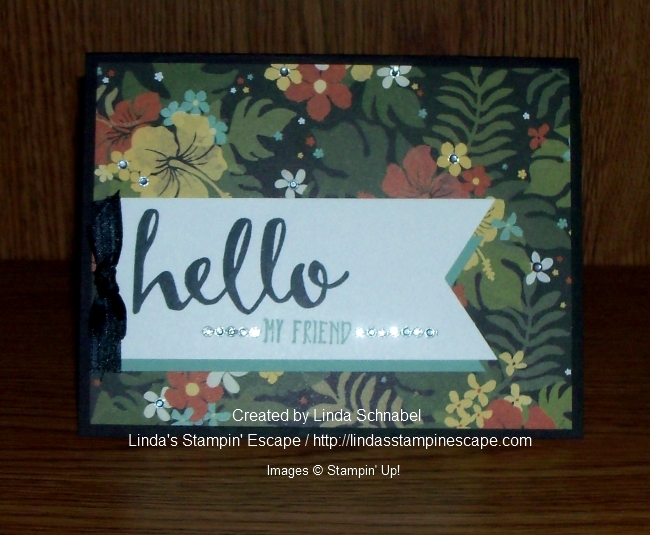 Again … today’s card features the Botanical Gardens (140583) Designer Series paper from the Occasions catalog and the “Hello” stamp set from our Sale-a-Bration catalog. Thanks so much for taking time on your Sunday to visit my blog. I hope you and your families got to spend much time together and had a wonderful holiday. Today I have a very special post for you. 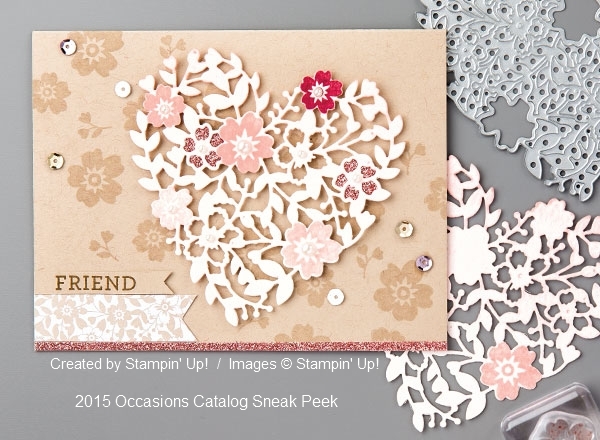 It is a sneak peek into a new product suite “Love Blossoms”. You will simply fall in love with the entire suite … the new “Blooming Heart” Thinlits Dies, the “Love Blossoms” Designer Series Paper stack, the “Blushing Bride Gimmer paper” (yes, you read that correctly), the “Bloomin’ Love” stamp set and the “Love Blossoms” Embellishment kit. All of these fabulous products will all be available for purchase on January 5th!! If you would like a copy of the new Occasions Catalog … let me know, I’d be happy to send any of my on-line customers a catalog. If you are one of my regular customers and did not get one in the mail, also let me know because I don’t want you to miss out on this one. Hope you enjoyed … Keep an eye out this week because I will be posting more sneak peeks for you. Christmas is here and I’m feeling very blessed. I have my family around me, a business I love, and an group of fellow stampers (YOU) who make it fun to come to work every single day. I hope you are surrounded by your favorite people and that you get exactly what you’ve wished for this Christmas, whatever that may be. I look forward to working with you again in the coming New Year.